In my previous article I provided some information on the Tektronix TDS 340 100 MHz digital storage oscilloscope and instructions on how to install the Option 14 card to get VGA output and support for hard copy. This article will provide some further information on interfacing the oscilloscope with a computer using the RS-232 port to retrieve raw signal data and share some of my interesting findings. The oscilloscope serial port must first be configured inside the Utility>System I/O menu and a cross-over serial cable is needed to connect the oscilloscope to the PC. It is best to turn off both hardware and software handshaking as they are not going to help much and will just cause problems. The recommended serial settings are 19200bps, 8 data bits, no parity, 1 stop bit and carriage-return (CR) line ending. If the probe of channel 1 is connected to the 1kHz calibration point in front of the oscilloscope, the above command set would return a value of approximately 1.0000E3, indicating a frequency of 1000Hz. The range of each returned integer value is –128 to 127 when DAT:WID is 1. Zero is center screen. The range is –32768 to 32767 when DAT:WID is 2. The upper limit is one division above the top of the screen and the lower limit is one division below the bottom of the screen. Among the returned values, the voltage per division, the time per division and sampling rate parameters (highlighted) will be needed to accurately analyze the returned data. The image data will be sent via the serial link. Unlike other commands, there is no end of file marker for the HARDC STAR command. To identify when to stop receiving data programmatically, one way is to count the number of bytes received and compare with the expected value. As the file size could vary depending on the hard copy output settings, an easier way is to assume that the hard copy operation has ended if no data is received after a certain period, e.g. 2 seconds. To use the application, first configure the serial port settings (port number, baud rate) and click on Open Port to initialize the serial interface. The Activity Log text box shows the commands sent and responses received. 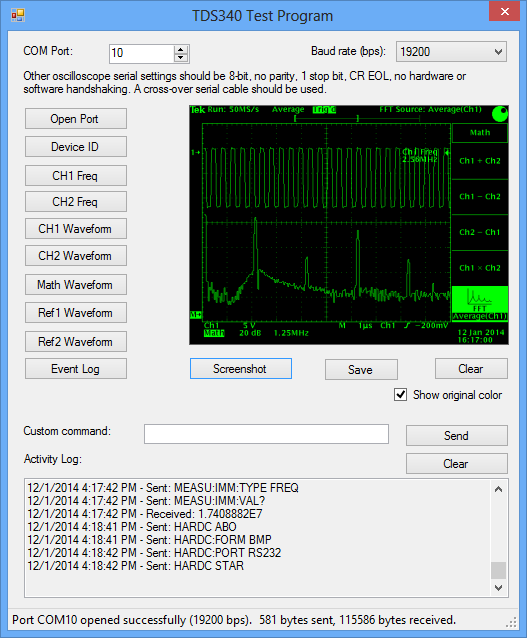 The Screenshot button will request for a screenshot from the oscilloscope and show it in the application. If option Show original color is checked, the application will convert the black-on-white image returned by the TDS340 to green-on-black, to make it look more like a real screenshot.The Event Log button will show all error messages currently in the oscilloscope event log. Due to the asynchronous nature of the DataReceived event of the .NET SerialPort component and the limited time that I have, I did not attempt to make the application wait for all data to be received before enabling the action buttons. For this reason, you will need to wait for a while and check the activity log after pressing any button to make sure that the command has finished executing before peforming the next action, otherwise the application behavior may be unexpected. The Visual Studio 2012 source code is included in the download package. Microsoft .NET Framework 2.0 (which is installed by default on Windows 7 or later) is required. The executable can be found in the bin folder. I was enthusiast for your very good article. I’ve followed your article connecting my TDS340A to my laptop. After open port command I’ve found that no buttons (commands) sent to the instrument have an answer from it. If I push “hardcopy” button onto the instrument I see incrementing bytes received up a certain point in which it stops with an error “parameter not valid”. Can you help me to troubleshoot this? Are you using a USB to serial adapter? Make sure that your USB to serial driver is correctly installed and it can send/receive data from serial equipments properly. Being able to send but not to receive data (and vice versa) is a common problem when using USB to serial adapters. Also check the serial settings on both the oscilloscope and your laptop and make sure they match. Try to select a lower baudrate e.g. 9600bps and disable hardware / software handshaking. If everything is correct it should work. Hello! Thank you for your work! You helped me a lot to deal with some problems. I bought myself the same oscilloscope with a small defect (menu is not displayed Components) first soldered adapter with DB9 to 15-pin on general schematic (without referring to the manual) and unfortunately Screen does not appear on the monitor (because of SCL SDA) problem was solved with the help of guides programmer, sent a team of bright, then the idea to write a programa that will perform terminal commands by pressing a simple button, but you have already made this! Once again many thanks for the interesting informative articles !!! FDD interface is very simple I think should work!